Franklin, OH - "Franklin will seek grant funding to help it pay for extending the Great Miami River Recreation Trail..."
Dayton, OH - From miamivalleytrails.org, "The bike/pedestrian bridge to/from Deeds Point MetroPark is closed for repairs. The Webster Street Bridge will serve as a detour around this project. Signs for the detour are posted in both directions along the Great Miami River Trail." Franklin, OH: "...Completion of the 1.4-mile gap between Middletown and Franklin has been funded. Once it is finished [projected completion 2020], people will be able to hike or bike all the way from Middletown to Piqua. Hamilton, OH: From journal-news.com, "Recent flooding of the Great Miami River damaged bikeways along its shoreline, including in Hamilton. From miamivalleytrails.org, "In Dayton, a short section of the Great Miami River Trail is closed just upstream of the Monument Avenue bridge on the south/left bank of the river. "Cyclists coming from the direction of RiverScape MetroPark should reduce their speed at the I-75 overpass to dismount and navigate around the barricaded area. "With caution, trail users can get around the closure by using a small stretch of concrete slope revetment and the bottom portion of the paved maintenance ramp. On-street detours are also possible." With the completion of a property transfer, the city of Monroe is moving ahead with plans for its section of the GMRT south of Middletown. From miamivalleytrails.org, "We anticipate that the trail will be closed between the downstream end of Carillon Boulevard and East River Road Wednesday, November 8 to Friday, November 10. MCD is constructing a small retaining wall near the railroad overpass. "A possible way around construction would be via East River Road, an on-street trip of approximately 1.3 miles. This route is not particularly pedestrian-friendly, given there is no sidewalk along the road most of the way." From miamivalleytrails.org, "The flood wall in downtown Dayton is under repair, and work on the wall may result in intermittent closures of the Great Miami River Trail at the location on the south bank of the river, just a couple hundred feet downstream of RiverScape MetroPark. "Detouring around this area is a simple matter. The simplest detour is to use the Great Miami River Trail on the north bank of the river. Traversing through Downtown from RiverScape MetroPark to another trail access point down stream of the project location is another option. "Low spots along the trail in downtown Dayton are under water, including at RiverScape MetroPark and at River Run Structure 2 near the Dayton Art Institute." From journal-news.com, "A large new ramp now connects Hamilton's hiking/biking path along the shoreline of the Great Miami River with the city's new Marcum Park near the RiversEdge amphitheater, and city leaders hope the connection will draw bicyclists and others up from the river to businesses downtown." From journal-news.com, "...Middletown City Council Tuesday heard a first reading of an ordinance to enter a contract with the Ohio Department of Transportation for its portion of costs to extend the regional bike trail to the city limits from its current terminus north of the intersection of Breiel Boulevard and Ohio 73. "...The extension would assist in bridging the 1.4-mile gap between Middletown and Franklin..."
From journal-news.com, "The redevelopment of the former Americana Amusement Park will begin this year, Monroe city officials said. "Part of the plan includes using a section of the property to extend the Great Miami bike trail." From daytondailnews.com, "The Great Miami River, which is not at flood stage, is running high. Many stretches of the bike paths near downtown Dayton are covered with water." From miamivalleytrails.org, "This week the City of Dayton began work to replace the Helena Street Bridge over the Great Miami River. The project is expected to take more than a full year to complete, and it does close a small portion of the Great Miami River Trail in Dayton. "If you are passing through Dayton along the Great Miami River Trail you can simply bypass the closure by sticking to the east side of the river. That side could also be called the 'downtown side,' the 'RiverScape side,' or the 'river-left side.'" From metroparks.org/alerts/, "The North Great Miami Recreation trail is closed between Little York/Rip Rap area and 5949 Rip Rap Road. "This area is behind the Miami Villa neighborhood and will be closed for two to three days while the Miami Conservancy District works to reinforce the river bank in the area." I rode the trail from Deeds Park in downtown Dayton north to E Helena St. There is signage here that says turn left. After turning left there is no signage. After crossing the bridge turning around I entered Island park I found a sign in the park and proceeded north. It took me around in a circle. There needs to be a marked crosswalk where the trail meets E Helena st, signage outside the park telling you to enter, and signage at the bridge in the rear of the park letting you know you must cross the bridge to go north on the trail. From daytondailynews.com, "Construction has begun on the second water feature at RiverScape River Run, the whitewater play park in the Great Miami River downtown. "...While construction is underway, parts of the Great Miami Trail along the riverfront will be closed. The closures will continue during the city of Dayton's Lights in Flight Fireworks Show and Festival on July 3. Snow fencing will mark the parts of the trail that will be closed." From miamivalleytrails.org, "The Great Miami River Trail will be closed between the Fishburg Road parking lot and Little York Road beginning Wednesday, June 22 through Wednesday, June 29. The trail will be marked with closure signs and trail users will be able to detour onto Rip Rap Road between the Fishburg Road lot and the parking lot for Rip Rap Park." From miamivalleytrails.org, "Five Rivers MetroParks will be clearing heavy brush and reach arm mowing on the Great Miami River Trail from Fishburg Road south starting Monday, June 20, 2016 from 9 am to 3 pm daily." From miamivalleytrails.org, "The Great Miami River Trail behind the former power plant in Piqua, OH will be closed beginning Monday, March 21, 2016. "The closure is scheduled to last 2-3 days. A detour around the front of the former power plant will be available. Signs will be in place marking the closure." From metroparks.org, "The area from The Wagoner Ford Bridge over the Great Miami to the parking lot at the intersection of Rip Rap Rd. and Fishburg Rd in Huber Heights is closed for maintenance. The trail will re-open at 3 p.m. this afternoon." From miamivalleytrails.org, "Reach-arm mowing and heavy brush clearing will be occurring on the Great Miami River Trail from the Miami-Montgomery County line near Old Springfield/Ross Rd. south to the Taylorsville Dam from 9am-3pm from February 8, 2016 through the end of the month. Sections of the trail will be closed as the crew works south." From miamivalleytrails.org, "A section of the Great Miami River Bike Trail in Miamisburg is closed as of Juanuary 14, 2016 and is set to reopen on Saturday, January 23, 2016. "The city of Miamisburg is building a new pump station and other sewer infrastructure in the Bell Park area between Linden Avenue and Rice Field. Two pipes are being laid across the bike trail to drain water from the construction site to the river. The trail will be accessible once two concrete ramps are constructed above the trail, over the pipes. "Trail users should approach the area with caution as they become accustomed to the ramps. "The ramps will remain in place for most of the project, which is expected to last until autumn of 2016." Facilities: At various trailheads and parks along the trail. Worth Noting: 2 gaps remain in the southern portion of the bikeway. At this time, completion is within reach as existing trail totals about 80 miles, with a continuous segment of 58.5 miles that extends from Piqua south to Franklin, OH. South of Franklin, 2 significant gaps remain before the southern end of the trail is finished. Originally the plan was for a 95-mile corridor which included Sidney, OH to the north. But there's been no mention of the Sidney connection in recent times, suggesting that the slight scale-back of this project may have been the result of land acquisition issues or other trail-building problems in that area. This bikeway is one of the more scenically diverse trails in the state. It follows the Great Miami River through Dayton passing above and below city streets as it makes its way along. The path actually serves as a viable alternative route for Dayton-area residents and is a great way for visitors to see a slice of the city. 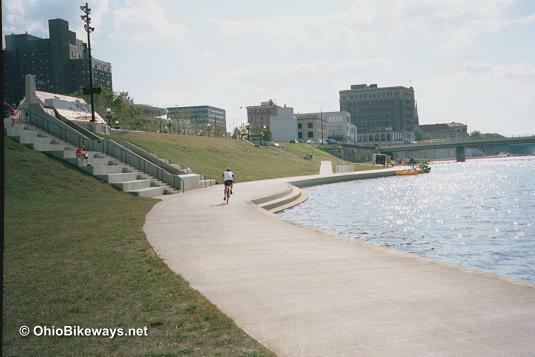 Highlights include: Interesting riding over ramp-like sections where drains empty into the river in Dayton, a bikeway bridge over the river at Island Park, and panoramic views from atop river banks. There's also an area called Riverscape in downtown Dayton which includes a Bike Hub. 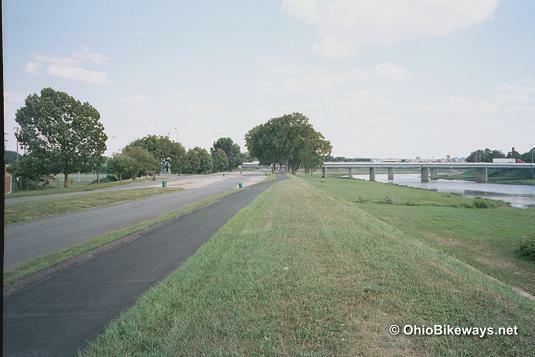 Moving away form Dayton, the bikeway stays along the river wherever possible and connects with parks, suburbs and small towns, as well as other attractions along its route. Recent reports suggest that navigation signage along the route is inconsistent. Good in some areas, while poor in others. The middle-section (of the 58.5-mile continuous trail) is apparently a trouble spot, particularly around Troy, OH. So, be sure to take a good trail nav app, or printed map along if you're not fond of straying from the main bikeway. Any trail of this size will have significant connections along its route. Here are a list of the connections to the Great Miami River Trail. The Mad River Trail links to Wright Patterson AFB, Wright State University and Fairborn, OH. But the most significant long-distance connection comes from the Mad River Trail's connection with the Creekside Trail (at Eastwood MetroPark), which in turn links with Xenia Station. 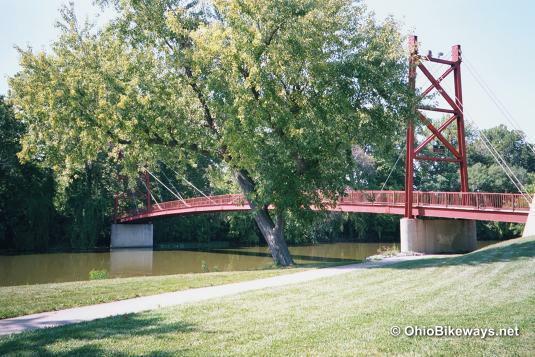 At over 300 miles of paved bikeways, the SW Ohio trail network is certainly impressive. But when you consider the additional connections from Xenia Station to central and northeast Ohio, via the Ohio-to-Erie Trail, the total trail network grows even larger. Ya gotta love it!